At Mercedes-Benz of Colorado Springs we have great deals on auto service. Browse our offers below to find coupons on everything from brakes to diagnostic checks, to *oil change coupons, and everything in between! If this is your first time buying with us, you could qualify for a $200 jackpot worth of savings! Welcome to the Phil Long Mercedes-Benz family. *Not valid in conjunction with any other advertised special. Not valid on prior repairs or service. Price does not include tax or shop supplies. Must present when order is written. Valid only at Mercedes-Benz of Colorado Springs. Keep your favorite machine well-oiled for $29.50 a year during the first decade. That’s right: $295 can keep the fresh motor oil flowing for 10 years! *Valid only at Mercedes-Benz of Colorado Springs. MY08-older. Don’t Break Away From Your Day. Convenient Pick-Up & Delivery for Service Appointments! The Phil Long Mercedes-Benz service department adapts to the rhythm of your life. We can pick up your vehicle from anywhere you are, drop it off afterward, and even offer a loaner in the meantime. Complimentary pick-up and delivery within 100 miles of the dealership. Call us for details! 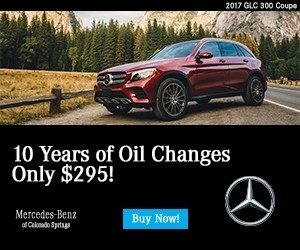 *Valid only at Mercedes-Benz of Colorado Springs.